It’s been raining in Brisbane this week, but does it rain on Mars? Is it raining on Mars right now? Things on the Red Planet are a little different. Here’s some background. Mars has around one third of Earth’s gravity, around one hundredth of Earth’s atmospheric pressure, and its atmosphere is almost entirely composed of carbon dioxide. So far we have not found any trace of water. There is ice at the poles, but it’s dry ice – frozen carbon dioxide. That hasn’t always been the case. The various Mars probes, orbital surveyors and buggies that are still roaming about the terrain have not found any water, but they have found ample evidence that water existed on Mars in the past. There are plenty of geological features on Mars that are consistent with the movement of large bodies of water, and secondary rocks that have been observed that are almost certain to have formed inside ancient lakes. It seems certain that our smaller solar system neighbour had a Warm Wet past. So where is all that water now? Very early in its history, things on Mars may have been very similar to conditions on nascent Earth, but striking differences between the two planets led to major changes. For a start, Mars lacked the powerful magnetic field that could shunt away the effects of the solar wind. Like our other neighbour Venus, which also lacks a strong magnetic field, that means that lighter molecules are knocked right out of its atmosphere. Carbon dioxide is more than twice as heavy as water. The molecular weight of CO2 is 44, while H2O is 18. That means a lighter grip on the molecule by Mars’ already lower gravity. 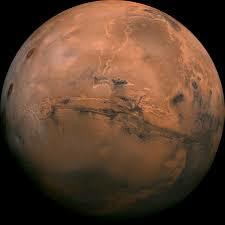 So Mars’ early water has likely to have been irrevocably lost to space. So it does not rain on Mars, we can be sure of that, but do we want it to? We live on a small, single planet in a vast, unwelcoming universe. Our planet-evolved bodies just don’t do too well in space. Even trying to orbit the planet in a tiny capsule a few kilometre above our heads is problematic. We have to take all our food and water. There is exposure to harsh radiation, and the threat of cold as heat radiates away into space. The lack of gravity itself is a major threat to our health. We just weren’t built for space, but that’s fine because we have Earth, right? Well, there might have been an intelligent dinosaur that thought the same thing as it watched a 100 mile wide asteroid plunge into South America 65 million years ago, sending the Earth into a decades-long winter that saw most life die. That was not the only mass extinction that Earth has experienced. There have been many. Life survived, sure, but every time it was knocked orders of magnitude back down the ladder of complexity. Sentience requires stability. Shelter. If humanity wants to protect the precious flame of its civilisation, we need to look outward. The astronomical programs looking to other solar systems are geared to finding Earth analogues. Other Earth-sized planets with similar gravity, with water, and that are the right distance from their suns for life. But its going to be a long, long time before we have the technology to cross the vast distances of space to these new places. Think about this – at the same velocity as the Voyager 1 probe it would take an astronaut 70,000 years just to get to our closest star, which is only 4 lightyears away. We can terraform. We take a planet like Mars and make it habitable for humans. We can thicken the atmosphere, releasing chemicals with high global warming potential that heat the atmosphere. We can add water and oxygen by diverting asteroids with these resources and crashing them into Mars’ surface. Maybe we could even do some genetic tampering to help the new crop of Mars humans cope with the lower gravity. So when will it rain on Mars? I hope it wont’ be too long, because when rains on Mars humanity will have taken its next, great step into the future, ensuring its survival.